A new study found that when temperatures get warmer, woodrats suffer a reduced ability to live on their normal diet of toxic creosote, suggesting that global warming may hurt plant-eating animals. While not all animal diets are as toxic as those of woodrats and other rodents that eat plants like creosote bushes or juniper, most mammals eat some toxins in their diet. In an ongoing evolutionary battle, plants evolve chemical defenses against being eaten and animals evolve liver enzymes or other ways to overcome or avoid plant toxins. Animals with diets that contain toxic plants include rabbits, pikas, marmots, possums, deer, moose, elk, bighorn and domestic sheep, horses and even cows. Any free-range domestic animal will face plants with toxins, say the authors. They are made of stronger stuff than we are, since activists claim we can't even eat sugar or sausage. University of Utah biologist Denise Dearing, senior author of the research, notes that "over 40 percent of all existing mammals eat only plants" and many more eat some plants. "Most plants produce toxins, so the majority of plant-eating mammals eat toxic compounds, and this may become more difficult to deal with as the climate warms," she adds. Birds also might be affected, she says. "This phenomenon will result in animals changing their diets and reducing the amount of plant material they eat, relocating to cooler habitats or going extinct in local areas." Previous research suggested that plant chemicals ingested by mammals would become more toxic at warmer temperatures. The new study showed how temperature affects the ability of desert woodrats, Neotoma lepida - also known as pack rats - to tolerate the toxic resin from creosote bushes, which account for as much as three-fourths of their normal diet. Creosote resin contains hundreds of toxic compounds, and woodrats live on amounts that kill or cause kidney cysts in other laboratory rodents. Earlier evidence that warmer temperatures makes plant poisons more toxic included pharmacological studies showing lab rats died more often at higher temperatures after being injected with foreign compounds. Agriculture research indicated that at higher temperatures, cows that got fescue toxicosis from eating fungi-laden grass were more likely to get sicker, lose weight, stop producing milk and have unhealthier calves than infected cows living in cooler temperature. As for desert woodrats, an earlier study showing that at warmer temperatures, they had reduced liver function to process toxins. The pack rats were anesthetized, and the warmer rats slept longer than the cooler woodrats, indicating the latter processed the anesthetic more quickly. Two other studies showed that white-throated woodrats ate more toxic juniper at cooler temperatures than at warmer temperatures, and that woodrats with a normal juniper diet could maintain body temperature more easily than woodrats eating rabbit chow - an indication that when the liver is working harder to break down toxins at cooler temperatures, it needs less of a boost to keep the body warm. In the new study, the researchers performed two experiments on desert woodrats living in a temperature-controlled lab and in "metabolic cages" so their food and water intake, urine and feces could be measured. In both experiments, the woodrats were fed commercial rabbit chow treated with toxic creosote resin extracted from creosote bushes. 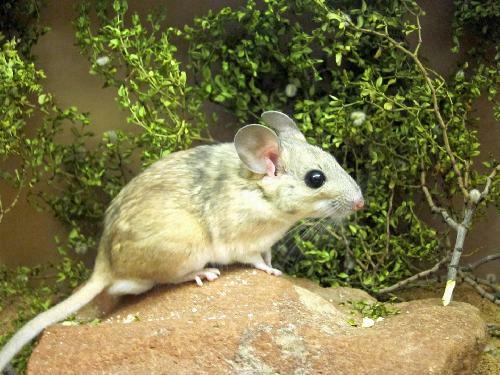 The woodrats and creosote leaves were collected with state approval from the Mojave Desert in southwest Utah. Previous studies found that mammals ranging from goats to koalas, possums and woodrats reduce eating to avoid too much plant toxin. The first experiment identified maximum creosote doses for desert woodrats living at warm and cool temperatures. Of 16 woodrats in the experiment, seven lived at a warm temperature (about 82 degrees Fahrenheit) and nine lived at what for the nocturnal desert dwellers is a cool temperature (about 72 degrees F). The woodrats acclimated to those temperatures for two to three weeks before the experiment began. The conditions weren't thermally stressful, meaning the rats easily maintained normal body temperatures. The rats were allowed to eat rabbit chow and drink water at will, while the scientists slowly increased the concentration of creosote in the rabbit chow from none at on the first day of the experiment to 12 percent after 21 days. Woodrats were not allowed to die, but were removed from the experiment if they lost 10 percent of their body weight. The results: At the warm temperature, woodrats ate less food overall and could eat only two-thirds as much creosote resin as woodrats at the cool temperature. The second experiment used 30 woodrats: 10 each at warm (about 84 degrees F), "room" (77 degrees F) and cool (about 70 degrees F) temperatures. All had unlimited rabbit chow and water, but this time they were fed the same amount of creosote resin - about one-eighth ounce per day - for 10 days. Woodrats were removed from the experiment if they lost more than 10 percent of their weight. The researchers measured how long rodents at the three temperatures remained in the experiment. By day five of the experiment, only three of 10 woodrats remained in the warm group, six of 10 remained in the room-temperature group and all 10 remained in the cool group. The results were even more striking by day 10: none of the 10 woodrats in the warm group remained in the experiment, only one of the woodrats in the room-temperature group remained, yet all 10 of the 10 rodents in the cool group still were in the experiment because none of them had lost more than 10 percent of body weight. In addition, the cooler rats ate three times more food than the woodrats at room and warmer temperatures, even though all three groups ate the same amount of creosote. The biologists expected the tolerance to creosote to decrease progressively as the woodrats lived in cool, room or warm temperatures. Instead, they found woodrats at cool temperatures tolerated the toxic diet but those at room and warm temperatures did not. Dearing adds: "There seems to be a threshold at which it becomes significantly harder for mammals to eat toxins. We've identified this threshold [77 degrees F in the second experiment]. With climate change, they are going to spend more time above the temperature threshold, and it's going to be harder for them." The researchers say liver processing of toxins may be reduced at warmer temperatures because woodrats must put more energy into regulating body temperature. "The mechanism that makes it more difficult for woodrats to consume toxic diets at warmer temperatures likely is not restricted solely to woodrats, and applies to plant-eating mammals in general," Dearing says. "As the climate warms, herbivores may face even more restricted menu choices." Published in the British journal Proceedings of the Royal Society B.